In general, you will be happy if you eat tacos. Have you noticed that? Who doesn’t like tacos? I wouldn’t hang out with people who don’t like tacos. The best tacos I ever had (other than my mom’s) were at Rockaway Taco. A couple of years ago, we had a family beach morning, jumping in waves and building castles with the kids. Around 11:30, we skedaddled our way to Rockaway Taco, ordered a bunch and ate them while sitting in the back end of our car. Then we went home, the kids took naps and we lounged the rest of the day. It was great. 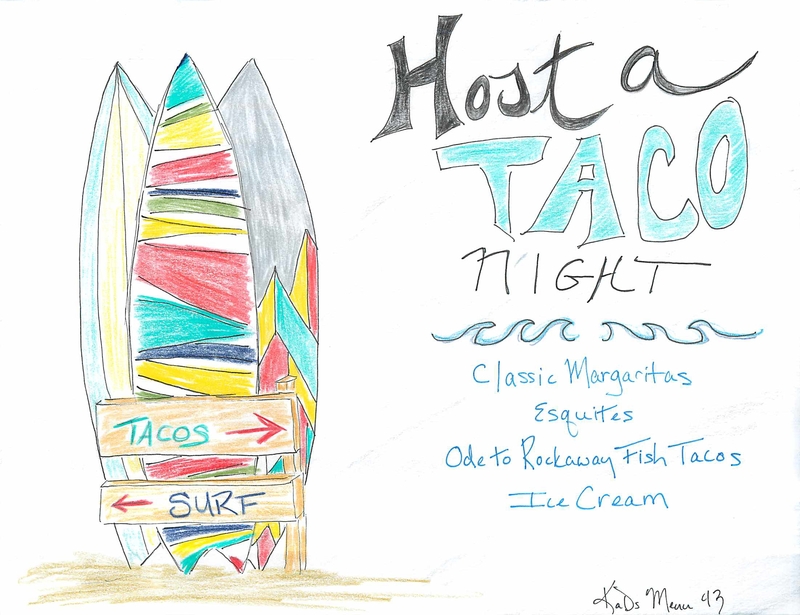 Rockaway Taco itself is now gone – sort of – it reemerged here: http://www.rockawaybeachsurfclub.com/food-menu. Go if you can! Because of Rockaway Taco, I associate tacos with surfing. No, I don’t surf. But apparently people who surf like tacos, so, you know, it all comes back to tacos in the end. Oh and June is International Surfing Month (because I bet you didn’t know that). This week re-create that taco surf moment and make a bunch of amazing tacos. Play surfer music if you want. Mix a big batch of margaritas. Whip up fried fish tacos topped with cabbage and spicy mayo. Serve with roasted corn salad – equites. Finish with a big dish of ice cream – ideally with your feet still in the sand. A michelada is the perfect start. This is not a drink for the faint of heart. If you like bloody marys, you will love this…if you don’t like bloody marys, well then can’t be friends. Tomatoes are still glorious so start with chili spiked crab salad stacked on an heirloom slice. The asparagus dish has a “put hair on your chest” chili topper, so let’s keep the lamb chops simple with salt and pepper. Now that the sun has set and the grill is cooling, finish the evening with Mexican chocolate pot de crème and a nice big spoon. The Michelada! There are a lot of recipes out there. I like THIS one. This is not a Corona drink – use Negra Modela, Bohemia, Pacifico, Dos Equis, or Tecate. Asparagus. A little involved but the pasilla cream can be made ahead. 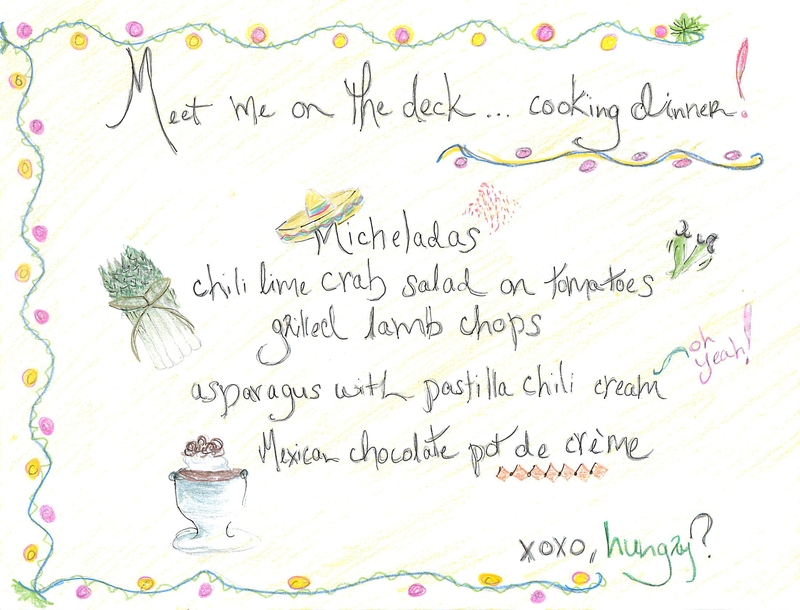 Oh and where to get the chilies? Amazon of course. Pots de Crème, oh my.